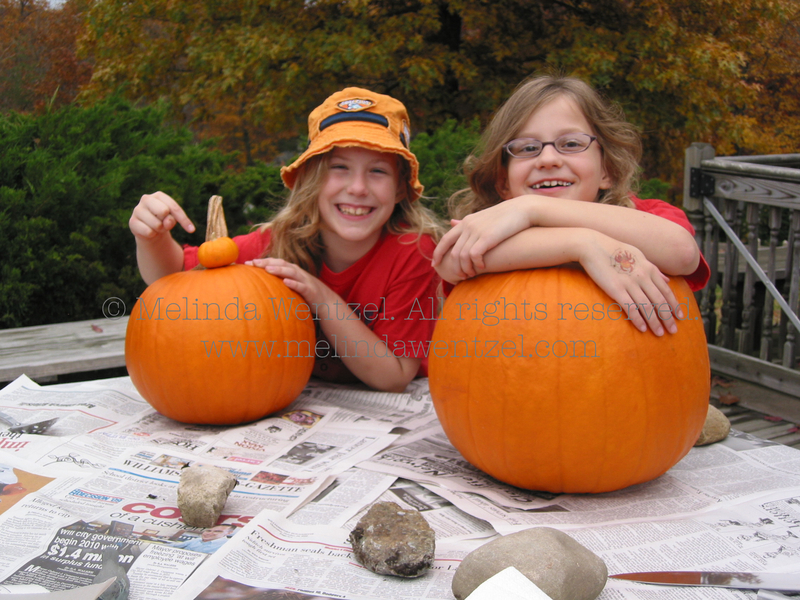 I’ve often thought that the art of raising children is a lot like carving a pumpkin. In both instances, I brought home a rotund little bundle of neediness, fumbling and stumbling over myself just to get it out of the car and safely inside. I then set it down, took a step back and stared—marveling at its inherent uniqueness and at its wealth of complexities, most of which I had yet to discover. A “Now what?” comment fell from my lips shortly thereafter as I contemplated my next move. Anxiously I paced the floor, studying this newish thing from every angle imaginable—careful not to overlook so much as a dimple or a distinctive feature upon its ruddy face. I then wrestled endlessly with self-doubt and indecision, fully and completely acknowledging the challenges that lay ahead. At once, I also considered the endless potential this wonder of wonders possessed, pondering the remarkable role I would undoubtedly play in the days to come. I prayed for insight and wisdom, and for the ability to make its spirit glow and its face shine brighter than bright. I loved and nurtured it unconditionally, shaped and molded it tenderly yet purposefully, pouring forth every single ounce of knowledge, creativity and patience I could muster, in hopes that one day my little pumpkin would stand on my doorstep straight and tall, illuminating my world forevermore. A beacon in the night for all who would pass. But no one ever told me there would be muck in the middle—a slippery, slimy mass of gloppage with which I have had to contend, time and again, in order to move forward. My hands don’t lie. They’ve been mired deep within this monstrous task for an eternity. And it shows. I am worn and weary, doused with sticky remnants of the chore. There have been a multitude of tricky corners to navigate with precision and grace, and unforeseen lumps and bumps to address along this winding path of growth and development. Countless hours have been spent scooping out and whittling away that which is undesirable and stubbornly rooted—the gunk which would surely detract from inner beauty. Desperately, I have sought the counsel of others. I’ve searched long and hard for guidance—for some sort of pattern to follow so that I could avoid a minefield of mistakes and make the right impression in the end. Heaven forbid I mismanage so much as a solitary stroke of my efforts. What I find both completely frustrating and strangely wonderful about the whole process, however, is that despite the planning and the commitment and the intensity with which I have approached it all, the end result is virtually unknown until I lay down my tools, step back from my work and light the flame within. Only then will I learn how well I’ve done my job—when my pumpkinish creation stands before me, glowing on its own amidst a sea of ink. Mere glimpses of what will be are all I have been afforded along the way. But glimpses, nonetheless. Happy Halloween to all those makers of little jack-o’-lanterns, whose work is truly a labor of love and whose efforts are worthy of high praise—regardless of the outcome. Comments Off on It’s the Great Pumpkin, Charlie Brown! Thanksgiving Day is almost upon us. Time for family, feasting and a well deserved respite from the impossible demands and harried pace of life. Time for bribing my kids to wear dress clothes, for hiding the abomination of clutter that exists within my home and for treating the reluctant gravy stains that will inevitably occur. Time for bickering about Paterno, Pittsburgh and the absurdity of Palin’s new reality show. Time for snapping wishbones, smoothing tablecloths and clinking fancy silverware. Together. It’s time for pies, pictures and parades, too, as we reconnect with loved ones, near and far. Mostly, though, it’s time to gather and to give thanks for harvest and health, just as it was at Plymouth in 1621. Indeed, it is time to give thanks for the many people and things deemed instrumental in our lives. …for being a good listener in spite of the vat of foolishness I’m sure to have delivered over the years…for reminding me that you can never have too many friends or woolen blazers…for emphasizing the importance of pausing when a child speaks, allowing the void to be filled with what’s really on their minds. …for letting me do stupid (yet exceedingly edifying!) things—like putting all kinds of time and energy into a less-than-seaworthy raft, like chewing gum in bed, quitting band, forgoing French and studying till 3am for a physics test…like getting a disastrous perm, allowing gossip to consume me and dating boys with long hair and fast motorcycles. …for tolerating my imprudence and forgiving my mistakes—like burning our water pump, which transformed our swimming pool into a pond overnight…like tormenting our sitters unmercifully, forgetting your birthday and breaking God-knows-how-many windows and flower vases…like betraying your trust by filling our house with teens and booze while you and Dad vacationed in Florida. …for encouraging me and inspiring a sense of belief in myself, teaching me to accept what I have and to handle disappointment when it visits…for helping me recognize the inherent value in power naps, mental health days and a good, long cry. …for letting me go…on the mother of all road trips with eleventy-seven of my closest friends…to the lake with the aforementioned motley crew…to an insanely large university where I would surely be swallowed up in lieu of finding my path in life…for biting your tongue when I quit my job in the city and when I married the wrong man. …for introducing me to the almighty Crock-Pot, to the concept of saving money and to the notion of waiting for the real prize instead of grasping desperately for the veneer of gratification. …for underscoring the importance of writing thank you notes, of spending time with my grandparents, of talking to babies and of liking myself—even when I’m least likeable. …for teaching me how to sort laundry, to deal with a loathsome roommate, to make a mean pot of chicken soup, to soothe a grexy baby, to contend with a rebellious teenager, to find a great pair of black flats…to appreciate the patina of a genuine antique and the untold merits of a good iron…to instinctively know when to opt for eggshell (as opposed to ecru)…to own my decisions, to list pros and cons and to always weigh my options carefully. …for loving your grandchildren with as much ferocity as you loved me, for implanting within me the seeds of faith and for instilling me with the impetus to seek solace within the pages of a good book and nurturance within the arms of a good man. …for letting me be there for you and Dad this past summer—likely fouling up your checkbook and misplacing things in your kitchen forevermore, but being there nevertheless. Planet Mom: It’s where I live (giving thanks).